Here’s how the kitchen looked originally with the metal garbage/recycling bins. 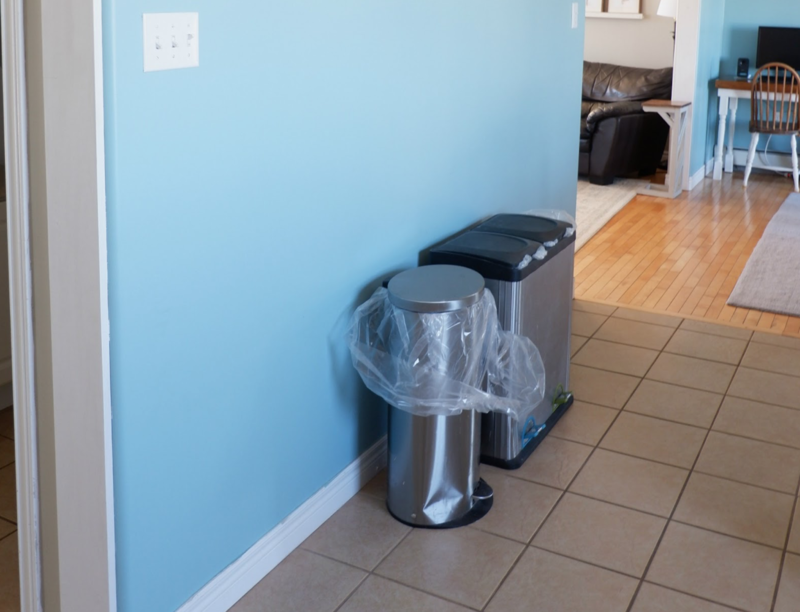 Some tuck bags of recycling into closets or basements, but neither of those are ideal options. Dreaming of a more attractive way to sort garbage, compost, paper, cans, bottles, plastic, and glass? The solution? 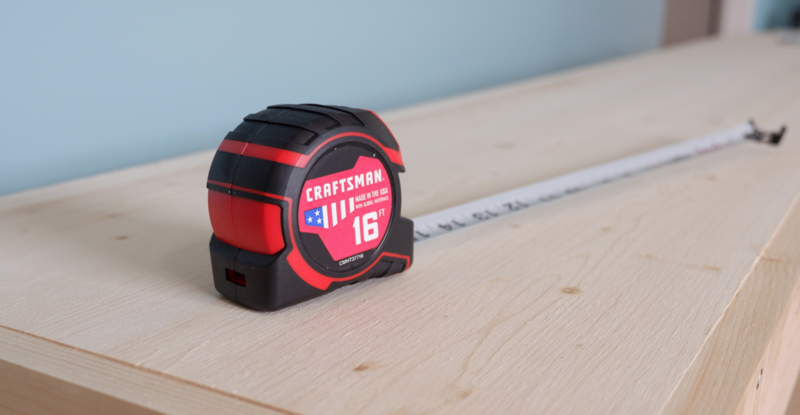 Design and build something completely original with your CRAFTSMAN® tools! 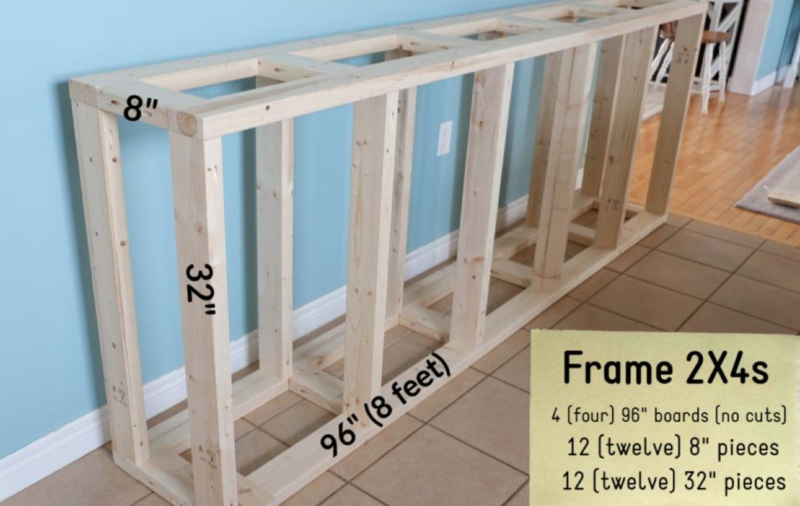 We used 2x4s to build two sturdy rectangular frames — one for the top of the unit and an identical one for the bottom — and then attached them with vertical 2x4s. 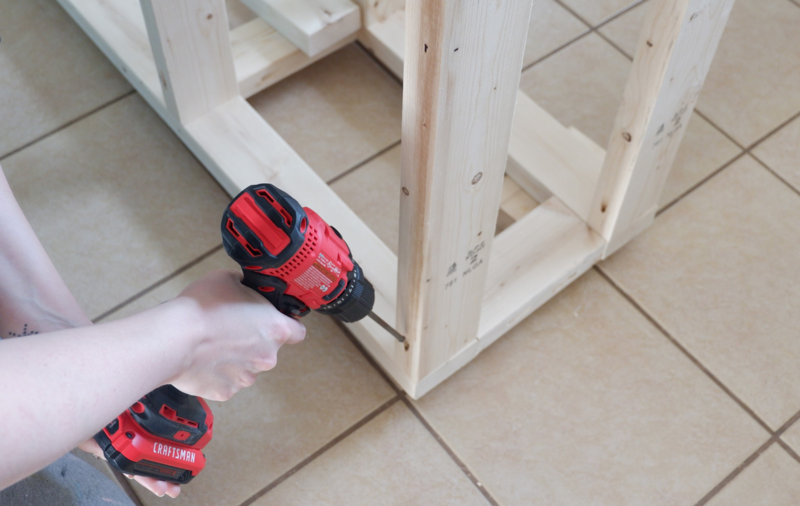 None of your original 2x4s will actually be visible in your finished project — they’re just the “bones” holding it all together. So now it’s time to cut the trim pieces that will make it pretty. 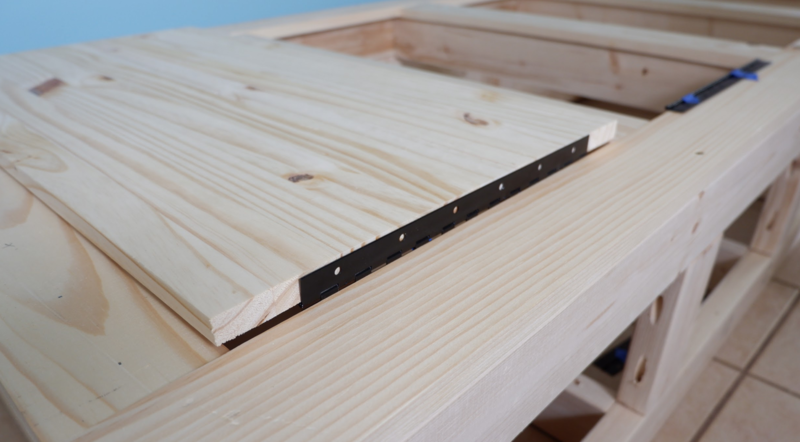 We secured the trim pieces so they peeked up over the 2x4s by about 3/4” — leaving a perfect little lip to hold the top in place in a minute. 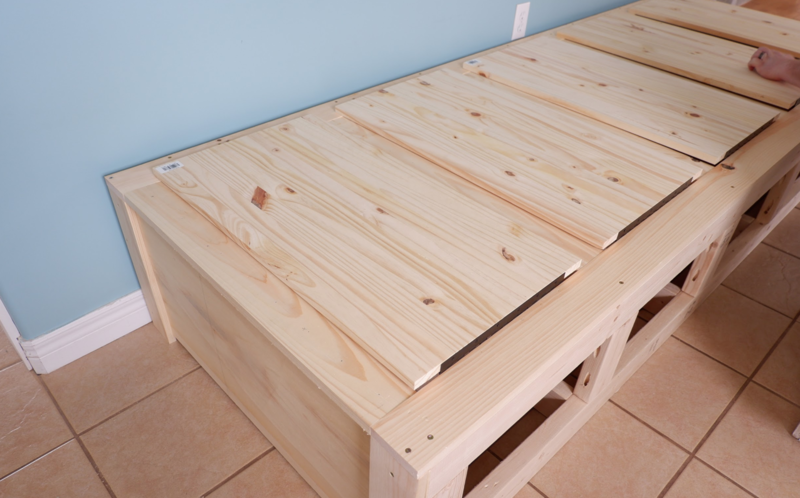 We discussed different ways to do the top of the “garbage hutch,” as we’d taken to calling it. We ultimately decided to spring for a 16” x 96” (8 ft.) laminated board that would be exactly the right length and width, rather than piecing together a top on our own. It slipped neatly inside the trim pieces we’d just installed. 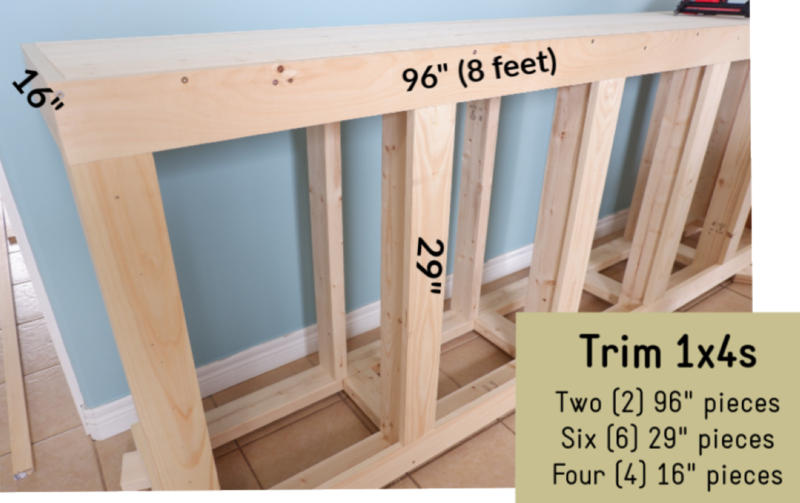 We also used plywood to close in the sides (each side piece measured 15” x 32 1/4”) by using our CRAFTSMAN® finish nailer. We opted not to close in the back of the unit, to save on wood, but also in case its ever needed to get inside to clean up a spill or pick up something that fell! We’ll come back to the top in a minute. For now, let’s move onto the doors. 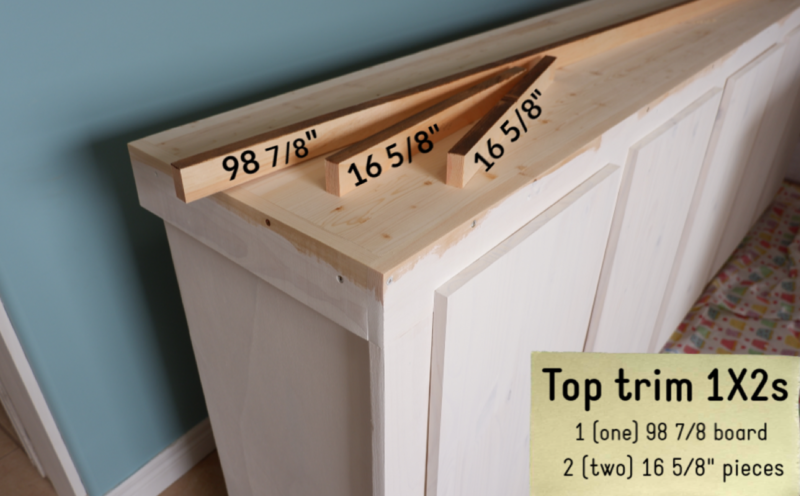 For the doors, we bought the same kind of wood we used for the top — just in different sizes. We needed five doors, so we bought five (5) 16” x 36” pieces and sawed them down to be 16” by 30” — the perfect size for the doors. 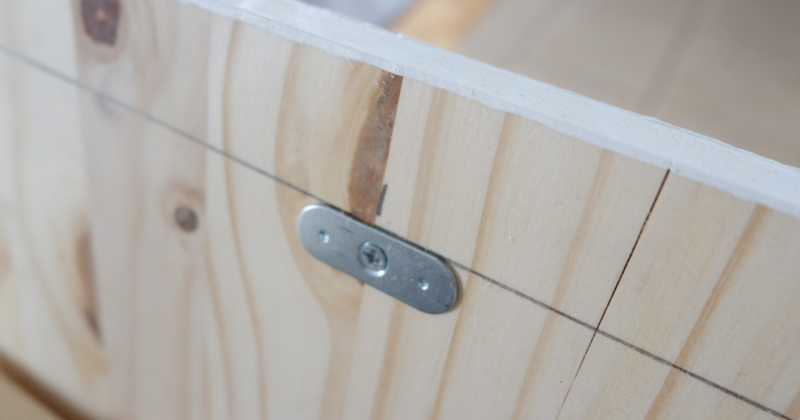 Then we used black continuous hinges to secure the doors to the trim, making sure they’d swing open the correct way. Around this point, we screwed in the little magnets to keep the doors firmly shut. ... and measured to find the center of the inside of each door (8” from either end) and screwed the flat metal plate there. STEP 5: Sand, paint, stain, seal! The whole unit needed a good sanding so it was nice and smooth, and then it was time to add some colour! 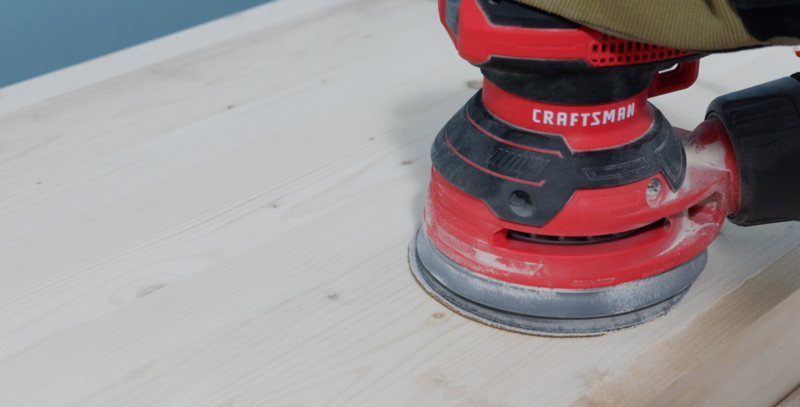 Our last step had been adding the beautiful solid top plank (16” x 96”). We knew to trim it out a little to make it thicker. Otherwise, the white paint would have gone straight up to the top and the made the top of the unit seem flimsy. So we cut the trim pieces need from a 1x2 board — 98 7/8” long for across the front, and two 16 5/8” pieces for the sides — and quickly stained just the underside of them. We didn’t want to stain that part once it was pressed up against the crisp white paint. 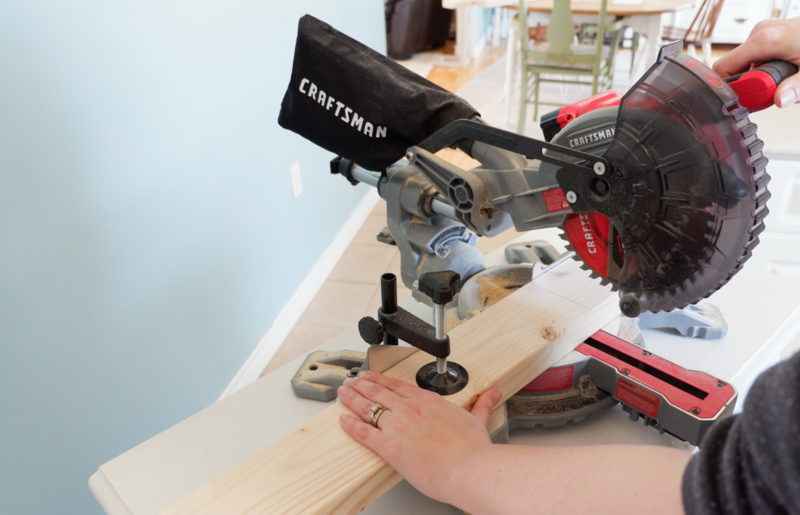 We used our CRAFTSMAN® finish nailer to attach the three trim pieces, gave it another quick sand so they blended nicely, and then its staining time! 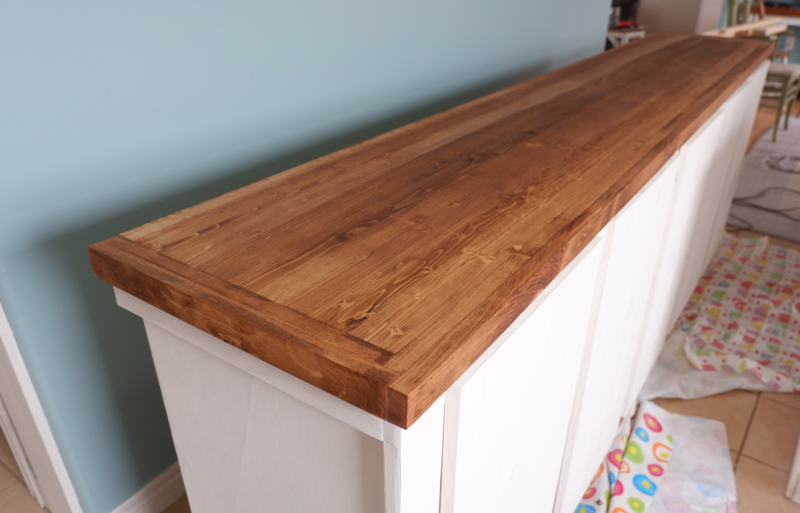 We brushed on a single coat and wiped it off almost immediately so the wood grain would really sing. Then we wiped on several coats of clear poly to make it nice and shiny! 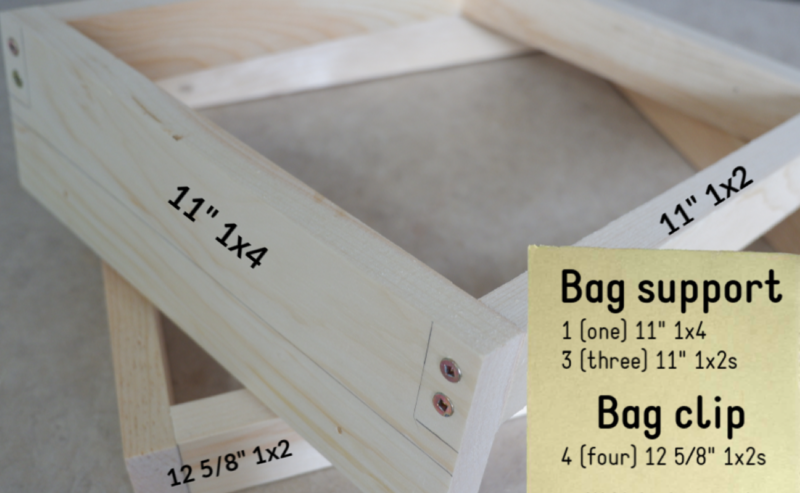 We will be using the two-square system to build a single garbage bin. One square has three sides made from 11” 1x2s and one side made from an 11” 1x4. This is the “bag support” that will screw into the door and hold the garbage/recycling bag. The other square is made from four 12 5/8” 1x2. This is the “bag clip” that will fit neatly over the bag support, sandwiching a bag in place so it doesn’t slip. 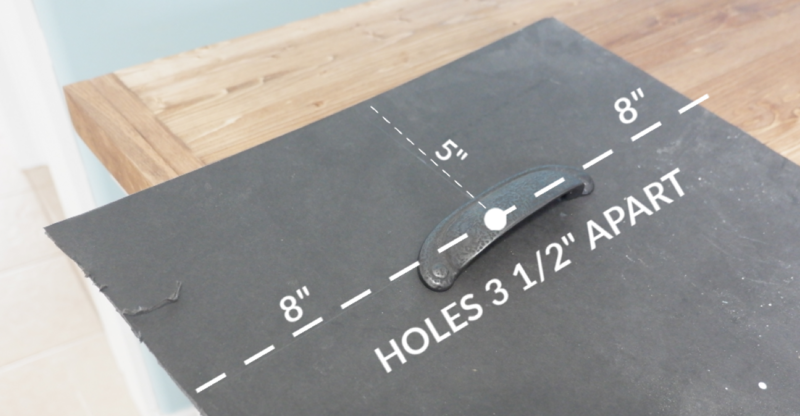 To attach the bag support, screw an 11” piece of 1x2 into the back of the door (about 8” down from the top of the door, centered). 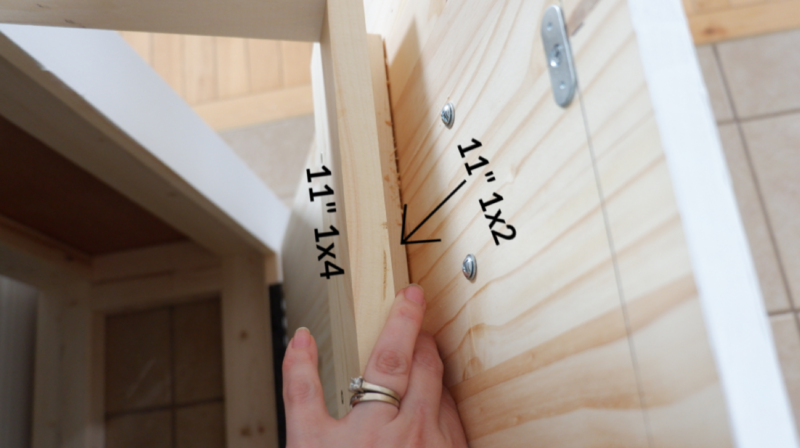 Then screw the 1x4 from the bag support into the 1x2 on the door, which creates a bit of a space between the bag support and the door. Make 1 support and 1 clip per door. 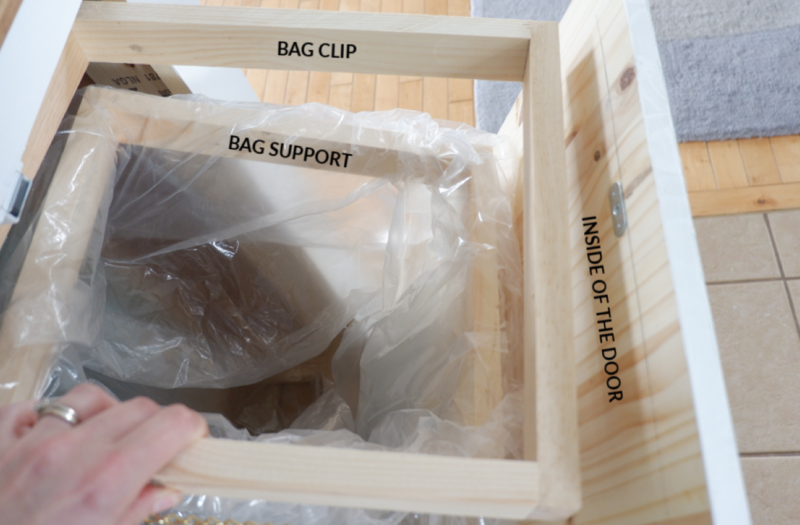 Pop in a garbage bag, pull the edges down over the bag support, and pop the wooden bag clip on to top to hold it in place. When it’s time to change the bag, just lift up on the bag clip, remove the bag, put in a fresh one, and put the bag clip back down. Easy peasy! 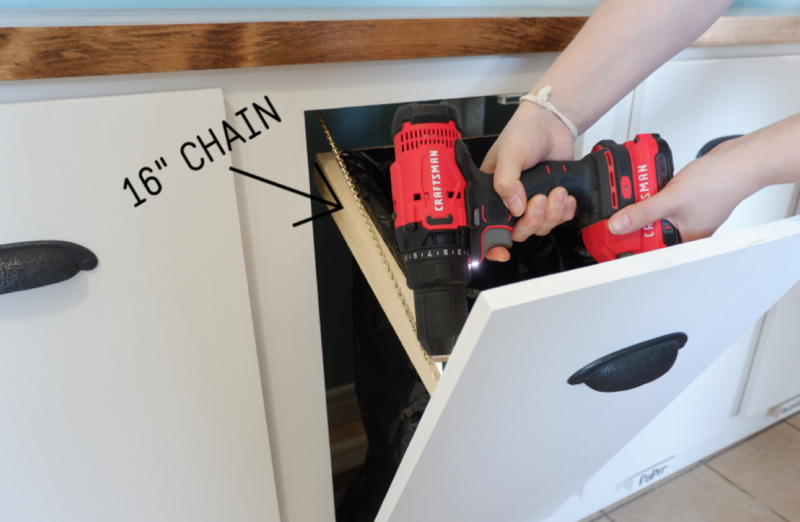 We screwed a 16” length of chain from inside the bin to the inside of each door, just so the doors didn’t fall all the way open — which would be hard on the hinges. 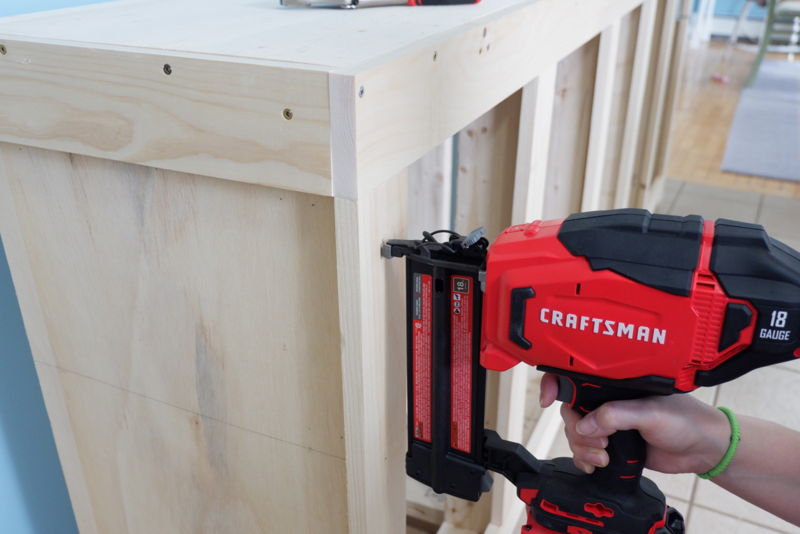 Pre-drilling the holes and use of a CRAFTSMAN® screwdriver to secure each cup pull in place is the next step. To make labels for each bin, we cut a spare 1x2 board into 5” (five-inch) pieces and painted them white. Then we printed out the categories (Compost, Garbage, Paper, Cans & Bottles, Plastic & Glass). It is now optional to pain the blocks with a tiny brush or a permanent marker. Project with CRAFTSMAN® is now complete!